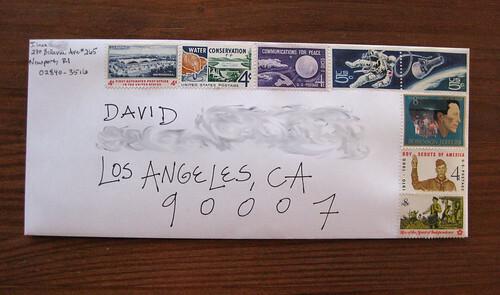 A letter to my cousin, using a bunch of our grandpa's old stamps. I guess it runs in the family to appreciate old things - my cousin digs the stamps as much as I do. So I try to use the extra-special ones on letters to him. I don't know what the two-stamp space 5-cent stamps are really worth (more than face value for a sheet, I'd speculate), but I think they are deeply awesome. That's such an interesting way to use old stamps! Thanks! I made it kinda big and stylized to fit this envelope.